This paper was drafted by three independent non-governmental experts, Mr Pierre-Arnaud Chouvy , Mr Michel Koutouzis  and Mr Alain Labrousse , and is entirely their own work. It is based on sources provided by international organisations or by the States attending this Conference. « Opium was probably one of the many products transported along the so-called “silk roads”, which had numerous branches that separated and then joined together again, skirting around mountains and deserts, and linking oases and market towns  . The term “silk road” itself, however, dates only from the 19th century. This is long after the caravan trails were interrupted by the Mongolian invasions of the 13th century and the Eurasian trade route was abandoned in favour of maritime trade in the 15th century. The development of the production of and international trade in opium in Asia dates principally from the 18th century, and more particularly from the 19th century, when the European colonial empires shared a large part of the Asian continent between them. However, the opium trade could not use the Central Asian routes, apart from those in Chinese Turkestan, as Lower Central Asia was suddenly closed off after Russia took over the khanate of Khiva in 1873. Central Asia’s loss of secular links with the south became even more pronounced in 1894 when a Customs Union between Russia and Bukhara was established and Russian border guards were deployed in the southernmost areas of the emirate. This was how the southern border of the Russian sphere of influence closed off and isolated Central Asia from southern and south-western Asia  . Opium production and trade then became concentrated south of both the Russian sphere of influence and the Himalayas, extending from Turkey and Persia to British India, the Indo-Chinese peninsula and, of course, China . Most illicit opium trading was done by sea, in particular by the renowned clippers. The movement of illicit opiates along Central Asian transport routes is thus a new phenomenon rather than history repeating itself. » Excerpt from Pierre-Arnaud Chouvy, Les territoires de l’opium, Geneva, Olizane, 2002. 0.1 The routes used for illicit drugs produced today in Central Asia, mainly in Afghanistan , are for a large part the result of recent upheavals in the vast area stretching between this part of the world and Western Europe. Since the Berlin Wall came down, the frontiers between East and West have opened up and trafficking of all types has sprung up in a world governed by market forces which often make no distinction between legal and illegal goods  . This trafficking is all the more difficult to control because it nurtures the conflicts provoked by ethnic, religious or border-related antagonisms. This is why such a large number of nations have gathered here to discuss a problem that originates chiefly in one country. 0.2 However, this problem has another cause, and that is the demand for these products. The economic, moral or cultural factors that have led to the development of drug use firstly in Western Europe have extended to Eastern European countries due to the difficulties arising from the very rapid transition between two radically opposed economic and political systems, and the appearance of types of behaviour derived from the West. In the Caucasus and in Central Asia, the various wars, political, economic and social upheavals experienced by several countries have also been the cause of the explosion in illicit drugs consumption addiction. This is why, if the upheavals experienced by Afghanistan for more than twenty years had not occurred, it is likely that another country – or group of countries – would have become the source of the opiates consumed in Europe. 0.3 Before 1979, Iran and Pakistan were the two main producers of illicit opiates in the Golden Crescent  . After this, the major political changes that took place in Iran put an end to production. The prohibition policy introduced in Pakistan led to a substantial reduction in opium production there. However it did not anticipate the consequences of the war in Afghanistan : the transit of drugs and the manufacture of heroin in the border regions. 0.4 In fact, in Afghanistan , production, which before the conflict had not exceeded 200 tonnes, increased tenfold during the war. The reasons for this increase were less the need for the mujaheddin to finance their arms purchases (they were already receiving weapons in large quantities), than the lack of State control over the rural areas and the vital needs of peasants and refugees in a country devastated by war. After 1989, the situation was aggravated by the conflicts between various factions. According to the first UNDCP field survey, production was around 3200 t. in 1994  . The Taliban were then content to manage the situation by taxing the peasants and traffickers, which resulted in record harvest in 1999 (4600 t.). The ban announced by Mullah Omar on 27 July 2000, although there were very high stock levels in the country, led to the almost total disappearance of production in the areas controlled by the Taliban  . The situation that existed in Afghanistan in the autumn of 2001 meant that the peasants again planted poppies on a large scale. According to UNDCP, at about 3400 t. of opium, the 2002 harvest pushed Afghanistan back into the lead as the main world producer  . 0.5 An increasing proportion of the harvest is now processed into morphine base or heroin in laboratories within Afghanistan . The remaining processing is done outside the country, along the routes, in particular in Turkey where the chief of police stated in August 2001  that, despite substantial destruction, a great many laboratories remained under organised crime control. 0.6 The routes used by illicit drugs and chemical precursors are not important simply as transport routes for illicit goods, they also carry with them a whole series of severe nuisances which will be discussed later. The illicit drugs trade does in fact have economic repercussions and cause serious public health problems. All of the problems they cause prompt, or should prompt, responses from the authorities adequate to the situations they cause. 1.1 Drug traffickers “do not invent the routes”, as they often use the main traditional axes for commerce and trade. These axes are sometimes determined by geographical conditions, passes in mountainous areas, oases in desert areas, shipping channels, etc. When the safety of the route and of the traffickers is threatened, an itinerary can be momentarily abandoned for alternative routes, because the minimisation of risks is more important than the length of the route. Generally speaking, over the whole of the Eurasian continent, the marked increase in movements of goods by land or by sea, between countries formerly surrounded by more or less closed borders, makes it easy to hide illicit goods amongst licit cargo. The abolition of frontiers inside Europe has had the same results. Even with very sophisticated methods, it seems impossible to control millions of tonnes of freight when every country is being encouraged to facilitate international trade and to limit obstacles to the free movement of goods. 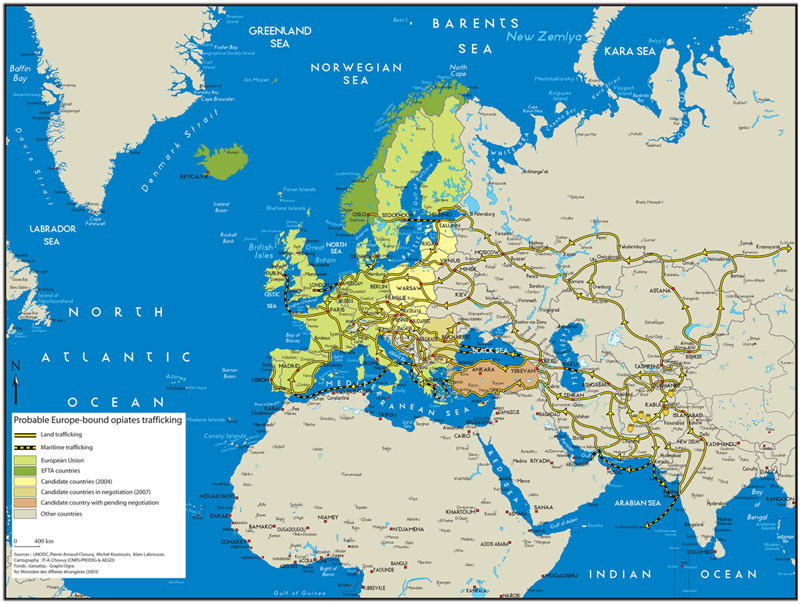 1.2 On an east-west axis that starts in Afghanistan and ends in the heart of Europe, the commercial routes vary greatly. They are numerous at the start of the axis, most often camel trails or mountain paths, frequently blocked by obstructions which are physical (passes, deep valleys), political (frontiers) and geopolitical (internal and external conflicts). Further west along the routes occur two changes. Firstly, the roads become more visible and more substantial. Secondly, from Turkmenistan to southern Russia, they cross a series of political-administrative and military no-man’s lands (Karabakh, Turkish-Armenian and North Caucasus frontiers, etc. ), where the state of emergency transforms them into obstacles that have to be avoided. Only a few passing points vital to the economic survival of the surrounding regions and transnational trade remain operational, (the Meghri frontier (Iran-Armenia), the “military route” (northern and southern Ossetia), Nakhichevan ( Armenia – Azerbaijan – Turkey ), Sarp, or Sarpi, ( Georgia – Ajarian Autonomous Republic – Turkey ), etc. Yet the fact that obstacles help to make goods costlier is obviously in the interest of traffickers despite the risks they run, all the more so since they alternate legal goods, often desperately needed, and illegal goods in their freight. The border crossing formalities are carried out by officers who often simply levy “informal taxes” at low rates, in return for which they allow the passage of large volumes of freight without completing many checks, which avoids paralysing the border posts and prevents long queues. The freight, whether licit or illicit, therefore passes through without difficulty. Incidences of corruption must be added to these common practices and these may go up as far as the higher levels of administrations, which explains the current mobilisation of international organisations like the UN, OECD, Council of Europe, World Bank, etc. 1.3 What is most important for the organised crime attracted by these outlawed areas outside, is the fact that the route is negotiable  : informal tolls, negotiation and corruption determine movements. Thus, thousands of kilometres of roads, intersected by hundreds of checkpoints, give the trafficker absolute security at derisory costs far outweighed by the benefits. The trafficker, as a clever entrepreneur, will invest his initial profits first and foremost in local people and organisations. Day after day, he will increase his authority over longer portions of routes. It is thus understandable that most of the seizures made by the police and customs services are made on the basis of precise information which allows them to target their checks in the midst of the mass of goods transported. Yet, carrying out systematic checks with dogs on some roads, as the Iranian services do, also leads to major seizures. Based on the data provided by the countries concerned, an outline of the opiates and chemical precursor routes can be given. 1.5 From Afghanistan two major trafficking axes allow opiates to be exported to Western Europe, whether opium, morphine or heroin: in the south, the Iran route (referred to below as « route A » for greater clarity) which then becomes the Balkans Route; to the north (route B), running from Central Asia to Eastern Europe via Russia and Ukraine (see below). 1.6 Afghan opiates therefore move mainly in an east-west direction, taking many different routes which, constantly adapting to local conditions on a large-scale, evolved considerably at the beginning of the 1990s. 1.7 Historically, the export route (route A) for Afghan opiates is the one that uses the roads and trails crossing the borders of Iran and Pakistan, via, in particular, the Iranian provinces of Khorasan and Seistan va Baluchistan and also via the North West Frontier Province (NWFP) and Pakistani Baluchistan  . 1.8 When these movements do not take the land routes towards Turkey , the Caucasus or India , which are as much consumer markets as drugs trafficking stages on the route to Europe, they may go to the Iranian or Pakistani coastal ports and become part of their considerable shipping trade, or, of course, go by air. 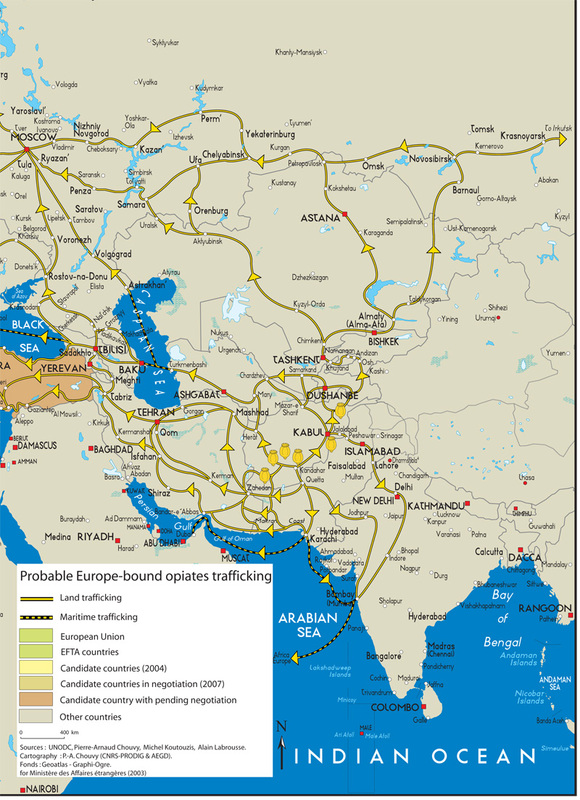 1.9 Apart from these “historic” trafficking routes, opiates also exit the region via Central Asia (route B), the borders of which, open since 1991, are outlets that are just as difficult to control. Tajikistan, and to a lesser extent Uzbekistan and Turkmenistan  , all of which share land borders with Afghanistan, have become major centres of regional drug trafficking to Europe of course, but also, and increasingly, to the Central Asian and Russian markets. Due to their geographical location, Kirghizstan and Khazakstan are outposts on these Central Asian drugs trafficking routes. 1.10 It is difficult to estimate the relative significance of routes A and B, as Iran estimates that 65% of the traffic transits through its territory, while the United Nations believes that only 46% of heroin and morphine do so (and 86% of opium, however)  . This difference in assessments may be explained by the fact that these trafficking axes intersect one another and the traffickers can very quickly change routes in response to law enforcement measures or market demand. For example, via Azerbaijan , drugs, which take the Iran route, can join up with drugs arriving from Central Asia. 1.11 There are several major routes along which heroin enters Western Europe, which sometimes overlap. The first relates to the northern roads (route B). It covers the territory of the countries of Central Asia, the Caucasus, Russia , Ukraine , Poland , and finally Germany . From there, the heroin can be transported further west, to the United Kingdom , over both land and sea, via the Netherlands and Belgium . The main routes are however still the Balkan routes and their continuations by land, in particular. Let us first take the land routes. The more typical route, which starts in Turkey and goes via Bulgaria, Romania at times, the former Yugoslavia, Hungary, Slovakia and the Czech Republic, leads to Austria and Germany. There are many alternative routes to this. Thus, more to the south, another route also leads via the countries of the former Yugoslavia and Albania , to either Italy or Slovenia , and from there further west. These two routes thus lead, from Istanbul and via both the Albanian speaking area ( Albania , Macedonia , Kosovo) and Italy or Austria , to the very heart of the Schengen Area. 1.12 In addition to this, there are those routes that are a continuation of the Balkan routes, via the north. The first goes from Romania to Moldavia and Ukraine . The second crosses the Black Sea and, going via Romania , Bulgaria , Slovakia and the Czech Republic, rejoins the route that comes from the CIS. Finally, not to be ignored is the maritime route, which starts in Turkey and crosses the Mediterranean, leading to Italy or Spain and beyond that to the United Kingdom and even further, to the United States and Canada . 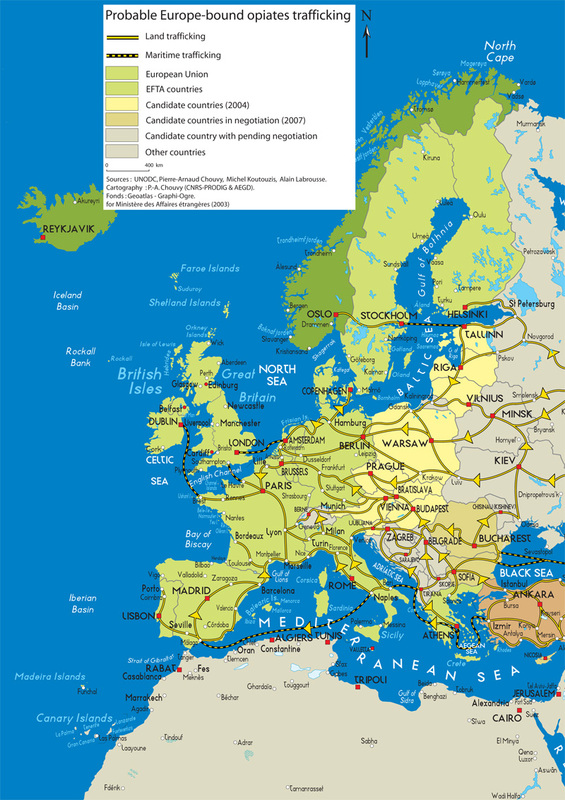 1.13 The abolition of internal frontiers within the European Union in order to allow the free movement of people and goods, even though it had been anticipated by organised crime, is likely to make controls more difficult. Today, seizures are made either at the external borders of European Community territory, or along the routes in the different countries, due to the efforts at cooperation between them, which have, for example, led to the creation of Europol. 1.14 All along these routes, cross-border ethnic solidarities are a factor that favours trafficking. From the producer to the user, the routes are divided into segments of varying lengths, each controlled by traffickers of different nationalities, who rely on nationals from each country. Even regional conflicts, in the Balkans for example, do not hamper business dealings between groups of traffickers from ethnic groups that political and military events set in opposition to one another. Common language, family or even clan ties, as well as other forms of solidarity within certain diasporas, provide trafficking networks with a high level of security, protecting them effectively from infiltration attempts by state authorities. Trafficking is thus conducted through transnational networks using all available means to achieve their ends, from the most archaic (physical violence) to the most sophisticated (in terms of communication, in particular), taking advantage especially of the vulnerability generated by the increasing free movement of goods and people. 1.15 A number of substances not usually produced by transforming countries are required to transform the plant raw material into chemical derivatives. The vast majority of laboratories is concentrated in two countries, Afghanistan and Turkey . The export flow of drugs overlaps with the flow of chemical precursors  , in particular acetic anhydride, the principal precursor, which is essential to the process of turning morphine into heroin  . They are transported into Afghanistan , the country producing the raw material (opium) from which morphine and heroin are also produced, or to all those points along the route where there are laboratories. When it is bound for Afghanistan , the acetic anhydride is derived from different sources: Russia , via the countries of Central Asia, Eastern and Western European countries (the United Kingdom , Italy and Germany ), and China via Kazakhstan and the other countries of Central Asia. 1.16 Seizures of these products in Turkey during 2000 and 2001  allow the origin to be clearly established, whether they are produced there or in transit. The countries are the Russian Federation , Georgia , Yugoslavia , Bosnia-and-Herzegovina, Italy , Bulgaria , Saudi Arabia and Syria  . Romania also produces acetic anhydride for the Turkish traffickers’ laboratories, whether these are « relocated » on its own territory or in Turkey . A large part of the acetic anhydride used by the Turkish traffickers, however, also comes from the diversion – despite legislation that has recently been strengthened in Turkey – of large quantities of this substance imported legally from Germany for the skin tanning industry  . 2.1 According to the ODCPP  income from poppy cultivation involves almost 3.3 million people in Afghanistan . These are 80,000 growers and their families (480,000 people) and 480,000 itinerant agricultural workers and their families (2.8 million people). Opium harvesters, traders and the traffickers thus only account for 20,000 people. The total value of Afghan opium production at farm gate price was estimated at US$265 million in 2000, a year when it was at the same level as in 2002  . If the income is divided amongst the number of families, although this only gives a very general indication, as there are considerable disparities between peasants with regard to the area cultivated and between these peasants and the agricultural workers, the income per family derived from opium is some $470 per annum (for 6 people in the case of peasant families). 2.2 In the same report, the ODCCP  stated that the global turnover for trafficking in opiates originating in Afghanistan (inside and outside Afghanistan ) could be estimated at some 25 billion US dollars, almost 100 times more than the amount earned by the growers and agricultural workers  . Last but not least, another advantage of opium being produced by peasants is that it gives access to credit, which is not generally the case for licit crops  . This credit exists in two forms: either the traders sell goods on credit to the peasants who will be paid at harvest time in opium; or else, and above all, through the system known as salam, the collectors of opium buy the harvest in advance, sometimes as much as two years in advance. In these circumstances, it is paid for at half its value, but this allows peasants to buy food during the winter. This system can of course turn out to be disastrous for the peasant if his poppy crops are hit by bad weather as happened in Helmand during the 1997/1998 season when it was only half or even a quarter of what had been expected. In such cases, the peasant has either to buy opium to pay his debt in kind, further indebt himself, sell his land, or flee to Pakistan . For those who had sold their harvest one year in advance, the ban announced by Mullah Omar also aggravated the deterioration of the peasants’ living conditions and helps to explain why the 2002 resumption was significant in paying the debts contracted. 2.3 Within the area made up of Central Asia and the Caucasus, the economic impact of illicit drug trafficking, itself just one of many forms of trafficking (cars, human beings, ferrous and non-ferrous metal derived from industrial waste, smuggling of licit goods – in particular mineral oils and cigarettes), is still considerable. Even today, both the line dividing formal and informal trade, and the barrier between the informal and the illegal, are ill-defined. There are two main reasons for this in the region. Firstly, an endemic economic crisis, a constant need for capital, and the survival strategies of destitute populations. Secondly, free trade inspired economic rules that are not framed within suitable legislation and/or an efficient financial infrastructure. Finally, from Central Asia to central Europe, the anti-laundering legal arsenal is at best insufficient and at worst, non-existent. Although the large industrial infrastructures, the ones that procure currency, are today being integrated into the global economic system (textiles, mineral oils, water, etc), the whole of the subsistence economy remains linked to the practices of an informal economy. By bus or by lorry, with the previously described system of buying complicity along the road, goods end up on the markets, but not just any markets. Market towns are disseminated throughout the area concerned, as Sadachlou, for instance, on the Armenian-Georgian border (in a region inhabited by Azeris), which supplies three countries – Azerbaijan , Georgia and Armenia – with all sorts of products. These are relay points which, situated on the trafficking routes, allow the spread of an economic model that facilitates all type of trafficking. But these towns also allow populations on the poverty threshold, where bartering is often practised, to obtain supplies cheaply. 2.4 Of course these practices, and this is true for the whole of the territory we are talking about here, hinder rational economic development. This is all the more true because the concentration of funds derived from illicit activities, particularly drug trafficking, then allow much more profitable mechanisms to be introduced: for example investments in infrastructure or equipment (roads, transport, property, hotel or other industries, casinos) or in the development of the import-export sector and joint ventures which indeed generate considerable profits. Yet the integration of capital derived from trafficking, and in particular drug trafficking, has its own rationale. Investments are not made just with a view to systematically increasing profits that have already been realised, but for the integration of capital (even at a loss), justification, or laundering of future profits of drug-trafficking. These investments are thus far from meeting the economic needs of the countries concerned. Worse, they impede integrated, rational and lasting development and compete unfairly with the official economy. They may in the end create areas of activity within each country that are dependent on models of development that encourage crime, and are economically unproductive. 3.1 In Afghanistan , ten years of war have prompted the growth of opium use and the appearance of heroin use, although for both the levels of usage are relatively low  . Reports received by the UNDCP  suggest that illicit drugs problems are developing in several large towns. People inject themselves with heroin in Herat (in the west) and Kandahar (in the east). At the beginning of 1999, 50% of illicit drugs addicts patients in the mental health hospital in Kabul were heroin addicts. In five rural districts studied in 2000, 0.5% of the population were opium users and 0.1% were heroin users. 3.2 During the 1980’s, Pakistan and Iran were in effect the main export routes for opiates. Data are fairly accurate for Pakistan so it can be considered as a model of the impact transit has on local usage. 3.3 In Pakistan during the 1990’s, and even though the routes had diversified, in particular via Central Asia, seizures of heroin remained at a very high level. Seizures, which had been 10.7 tonnes in 1995 fell over the following years then increased again to 9.4 t. in 2000 and 6 t. during the first 10 months of 2001. This relative stability of seizures was accompanied by an increase in usage. According to a national survey cited by the ODCCP, the number of heroin addicts was around 500,000 at the end of the 1990’s. However, the rate of HIV/AIDS infection is still relatively low. This can be attributed to the fact that heroin has been smoked or inhaled for a long time. Today, however, intravenous injection, in particular for synthetic drugs (amphetamines and multi-drug cocktails) is the most common means of administering drugs. In 1999, a UNDCP-UNAIDS survey into those who injected drugs in Lahore, Pakistan ’s second city in terms of population, showed a very high incidence of Hepatitis C, which gave rise to fears of a rapid rise in HIV. 3.4 Until the end of the 1990’s, Western Europe was the chief destination of heroin produced from opium poppy grown in Afghanistan . The upheavals that followed the fall of the Berlin Wall deeply altered this situation. If this production today continues to supply the western European market, most of the Afghan production also floods neighbouring countries or is unloaded along the transport routes that lead to Schengen Area markets. According to the ODC  , the number of opiates users is 2 million in Russia, between 0.8 and 1.2 million in Iran, 0.5 million in Pakistan and 0.3 million in Central Asia. 3.5 The Pakistani model (causes and means of the spread in opiate usage) can be applied to Iran , whose territory has become, since the beginning of the 1980’s, an extension of the main routes that start in Afghanistan and Pakistan . Despite the efforts of the authorities who have built walls and roadblocks over more than 800 km across the valleys that lead from Afghanistan, and lost more than 3000 men in twenty years in combat with traffickers armed with powerful weapons, the flow of drugs did not stop increasing in the 1990’s. The ODCCP classes Iran as the world’s leading user of opiates with an annual incidence of 2.8% amongst the over fifteens, ahead of Laos (2.1%)  . According to the Iranian DCHQ, the number of drug addicts is between 1,000,000 and 1,200,000. 67% of HIV/AIDS cases are caused by injecting drugs. 3.6 From the beginning of the 1990’s, due to the political upheavals in the region, the countries of Central Asia also became a very important channel, perhaps even the most important (see below), for the export of Afghan opiates, with the same consequences for drug addiction. According to the ODC study  , the number of drug addicts in the region (not including Turkmenistan ) is some 400,000. In the ODCCP study referred to above, Tajikistan , with an incidence of 2%, ranks third amongst world users of opiates. All the countries in Central Asia, and those in the CIS are also affected, to varying degrees according to where they are along the drug routes, or according to their economic and social situation  . 3.8 According to the Russian Ministry of the Interior, the number of illicit drugs addicts in Russia is more than 3 million, less than 10% of whom are registered. The situation is all the more alarming because illicit drugs addiction is affecting an increasingly younger population: 60% of illicit drugs addicts are between the ages of 18 and 30 and only 20% of them attend any educational establishment. In Ukraine , the number of opiates users could be as high as 220,000 people, 30,000 to 40,000 of them in the Odessa region alone  . 3.9 Turkey , despite the position it has on the illicit drugs routes, is a country that is relatively untouched by heroin addiction  . 3.10 In Europe, finally, over the space of only a few years, the effects of heroin trafficking have had a considerable impact in the countries of Eastern Europe that have become both countries of transit and user markets. According to the ODC  , 80% to 90% of heroin consumed in the Eastern and Western European markets comes from Afghanistan . The latest report from the European Monitoring Centre for Drugs and Drug Addiction (EMCDDA) states that “the main problem for all the countries applying for accession to the European Union is heroin”  . The only exception is the Czech Republic, where a locally produced methamphetamine, pervitine, is the main drug used. In the 1980’s and at the beginning of the 1990’s, the opiates used were local products like braun in the Czech Republic, poppy straw extract known as kompot in Poland, or shirka in Lithuania, etc. With the increase in the production of opiates in Afghanistan and the reduction in the price of its opiates, these locally produced substances have been gradually replaced by heroin. The most common method of heroin use is injection, which may account for 90% of cases treated in Bulgaria and Slovenia . The figure is also high in Romania and in the Baltic States. The situation is made worse by frequent needle sharing. In Estonia , where locally produced heroin was replaced by Afghan heroin in 1999, the number of users who had shared their needles in the last month went from 7.9% to 22.4% of heroin addicts in 2000. 3.11 With regard to infection by HIV, the EMCDDA report distinguishes between three groups of countries: firstly the Baltic States where the proportion of infected people is very high amongst illicit drugs users: in 2000, the figures were 90.8% in Estonia , 81.3% in Latvia and 72.3% in Lithuania . Second, there is Poland , where the incidence is between 11% and 16%. Finally, there are the other countries, where the percentage is zero in Romania and 6.5% in Slovenia . The marked reduction in Afghan production would at first only affect the countries where there is no tradition of locally made products, like Romania and Hungary  . In the other countries, if there were no heroin, a return to the traditional opiates would be likely. 3.12 According to the ODC  , Western Europe annually consumes between 80 and 120 tonnes of heroin (almost 9 t. were seized there in 2000). Even if usage tends to be stable, and even on the decline, according to the countries themselves, between 50% and 70% of patients asking for treatment are heroin addicts  . The EMCDDA report states: “Problem users represent less than 1% of the adult population in the EU, but experience considerable health and social problems … A considerable proportion of mortality rates amongst young adults (7,000 to 8,000 deaths annually) in the EU can be linked to illicit drugs problems (particularly opiate use)”  . In conclusion, we can affirm that opiate trafficking, partly due to its illicit nature, causes considerable damage: use of armed violence both to establish trafficking and impose its suppression, financing of non-governmental armies, large-scale corruption, dysfunctions in the workings of the economy, etc. But the most devastating effects are related to public health, and it is possibly in that area also that public policy can be the most effective with a view to reducing the damage caused by the use of illicit drugs. In fact, the introduction of harm reduction policies is one of the chief causes of the stabilisation or decrease of heroin use and related health problems in most countries in the Schengen Area. Geographer, researcher, National Scientific Research Centre (CNRS). Ethnologist and historian, expert at the UNDCP and the European Union. Pierre-Arnaud Chouvy: Les territoires de l’opium. Conflits et trafics du Triangle d’or et du Croissant d’or. Geneva, Olizane, 2002, 539 pp. Charif and Rostam Choukourov, Peuples d’Asie centrale, Paris, Syros, 1994, 230 p.
 International Narcotics Control Board (INCB) “Globalisation and new technologies/challenges to drug law enforcement in the 21st century” in 2001 Annual Report, New York, 2002, pp 1-8. ODCPP “Main Centres of Illicit Opium Production” in Global Illicit Drug Trends, New York, 2001. UNDCP /Regional Office for Southwest Asia “ Afghanistan . Opium Cultivation & Production” 1994. The United Nations estimated that production in 2001 was 185 tonnes of opium, only 35 tonnes of which came from the areas controlled by the Taliban, with the rest being produced in the regions held by the United Front (Northern Alliance). ODCPP “Annual Opium Survey 2002”, Islamabad, 2002. Statement taken up by the Turkish written press and television. On the location of these laboratories in 1998 and 1999, see the Institute of Forensic Sciences’ report entitled Global Study on Illicit Drug Markets, submitted to the United Nations Interregional Crime and Justice Research Institute (UNICRI), October 2000, p.32. In February 2002, the Turkish police seized 7 tonnes of morphine. On this point, see keynote speech by Mr.Jan van Dijk of UNODC to the 11th OSCE Economic Forum, Third Preparatory Seminar: « Trafficking in Drugs: National and International Economic Impact ». Statements by Tony Blair to the press, January 2003. But, according to a survey by the United States Office on Drug Control Policy, quoted by the ODCP (2003), p. 33, in 2001, heroin originating in Southwest Asia accounted for more than 15% of the market, or two-thirds of all heroin of Asian origin, while it only accounted for one third in 1999. DCHQ, “The National Drug Control Report – 2000 Islamic Republic of Iran”. In that country, seizures which totalled almost 2 tonnes of heroin in 1997, have since decreased regularly to 200 kg in 2000. UNODC « The Opium Economy in Afghanistan . An International Problem », New York, 2003. These are licit chemical products used in industry, legally exported, but diverted to laboratories mostly without the exporting countries and the industrialists themselves knowing about this. International Narcotics Control Board 2002, « Precursors and chemicals frequently used in the illicit manufacture of narcotic drugs and psychotropic substances », New York, 2003; and United States Department of State, « International Narcotics Control Strategy Report 2003 », Section XI: Chemical Controls. Ministry of Interior, Turkish National Police, department of anti-smuggling and organized crime (KOM) “Turkish Drug Report 2001”. “Since 2000 in particular, the assumption that the eastern Mediterranean countries that had not previously been used by traffickers to divert chemical products (Saudi Arabia, Israel, the Syrian Arab Republic, the Iran Islamic Republic) are now used to divert acetic anhydride towards the networks for the illicit manufacture of heroin, has been confirmed”, INCB, op cit., p. 79. During an interview for the programme “Envoyé spécial” (France 2) in May 1999, Unan Usal, director of Turkey’s anti-drugs forces, stated: “it is very difficult to make checks on hundreds of small to medium-sized tanneries that quite legally obtain acetic anhydride from the European market. Some have found a lucrative means of making the most of their purchasing power for this chemical product, by reselling some of it on the unofficial market”. According to a report by the Istanbul police in June 2000, “at least two dismantled laboratories, belonging to Kurds in 1999, were set up near to a tannery”. Given that prices were still very high in 2002 and at the start of 2003 (roughly US$500 per kilo, these figures should be significantly increased. On the other hand, this reasoning remains valid as regards the relative share of peasants and traffickers. ODCCP, op cit. p. 13. According to the later report quoted above (The Opium Economy in Afghanistan, an International Problem, New York, 2003), as prices remained very high (at around US$500 instead of US$50 on average prior to 2000, the ODC estimates revenues from drugs in Afghanistan at US$1,200 million, or 19% of GNP. UNDCP “ Afghanistan . The Role of Opium as a Source of Informal Credit”, Preliminary Report, Islamabad, January 1999. UNDCP “ Afghanistan . Community Drug Profile. Problem Drug Use in Afghan Communities: An Initial Assessment”, Islamabad, September 1999. ODC (2003), op. cit., p. 72. ODCCP, “World Trends in Illicit Drugs 2002”, New York 2002, p. 231. For a detailed description of drug addiction in Central Asia, with statistics, cf. ODC (2003), pp. 185-196. UNICRI “Odessa Drug Market. Analytic Research”, Kiev, 2000. Institute of Forensic Sciences, “Global Study on Illicit Drug Markets”, Report submitted to the United Nations Interregional Crime and Justice research Institute (UNICRI), October 2000. Op. cit., 2003, p. 33. EMCDDA, Report on the drug situation in the candidate CEECs”, 2002, Lisbon, 2002. There is in Hungary however some use of “poppy tea”, sometimes taken in combination with synthetic drugs. Op. cit., 2003, p. 31. Connexion | 57 queries. 0,486 seconds.